Last night, myself and two friends decided to take advantage of a rare night off together and head into Manchester’s Deansgate Locks for a bite to eat at Pitcher and Piano. Located along a strip of railway arches that carries the Metrolink line above, it incorporates two floors, both with outdoor seating overlooking the canal. On a rainy night though, inside is a lot more inviting, with comfy leather boothed seating dotted around between the two large rooms. After browsing their menu of homemade burgers, mains and salads, I went for their ultimate burger – The New Yorker (£13.45). Two 4oz beef burgers, one chicken breast, two rashers of dry-cured bacon, Butler’s Secret Mature Cheddar and beef chilli. A BBQ burger (8oz beef burger, dry-cured bacon and Butler’s Secret Mature Cheddar topped with jalapeños and BBQ sauce – £9.95) and Halloumi Salad (Pan-fried halloumi cheese, roasted butternut squash, sun-dried tomatoes, baby spinach, radicchio, sunflower seeds and lemon & caper dressing – £8.95) were also ordered along with a round of drinks involving Brookyln Lager (5.2%) for myself. I’ve tried Brooklyn lager before when I was last at Odder bar, it’s a light malt, soft with a slight dryness. There was a lovely roast malt aroma being released on the aftertaste and was a very easy drinker! 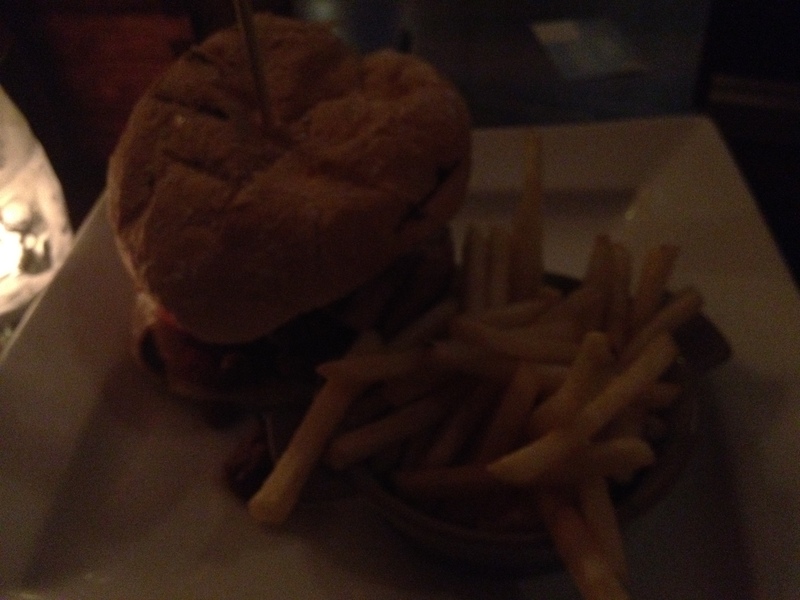 Our burgers arrived, presented stacked high with a small bowl of skinny fries on the side. Toppings of beef chilli dripping over the sides of the burger made this an impossible one to eat without the use of a knife and fork, but the size of the burger would deter the most able person. Piping hot through out, with the fries never once becoming stone cold. For an ultimate burger, it was finished rather quickly, yet it was the right amount to decline a dessert and also to not feel like your craving more. A good sign! We finished our visit chatting in the surroundings of this rather cosy environment, with some ambient music and the company of a few couples dotted around. It felt relaxed, which after a day in Manchester, is sometimes what you need before the commute home. And if your me, you’d have in your hand a Patron Coffee over ice. Heaven. We didn’t stick around to sample their drink delights this time, but I’ll be back – I noticed a Raspberry Sherbert (Bacardi Superior Rum, Chambord and Disaronno Amaretto shaken with lime and cranberry juice) that has my name all over it! To check out more from Pitcher and Piano in Manchester, including venue hire and bookings, click here. weights. Have a short break for a few seconds then do three or four more. hunters intend to sacrifice Ralph to the beast.